This book is full of horrors. The horror of losing your newborn child. The horror of being a stranger, unwanted and frowned upon. The horror of oppression, persecution, war, death. The wound of a country that suddenly finds itself split in two, families separated, people labeled as ‘’second-class’’ citizens. And then, all the questions overruled by a single phrase: ‘’what if’’. What if we had the chance to live again? To witness death and birth and wait for the cycle to start anew? This is the background of Jenny Erpenbeck’s haunting novel in a beautiful, soulful translation by Susan Bernofsky. In a story that spans countries and eras, our journey starts in Galicia at the end of the 19th century. A young couple of mixed religious background loses a baby girl. The pain is unbearable, the aftershock of the tragic loss comes swiftly and violently. In books connected by intermezzi, Erpenbeck takes us on a journey to Europe and its turbulent History. Our guide? The girl that died. Erpenbeck imagines how her life could have turned out if she had been given a second chance, her choices, and relationships in the heart of two countries whose course in History has been stormy, to say the least. Germany and Russia. Erpenbeck writes and her words enter your soul and mind and haunt you for days. The essence of the story is overcoming ordeals and sometimes this is just not possible. How do you overcome the loss of a child? It is against the law of Nature, it is Hell on Earth. The paragraphs describing the mother’s pain and the superstitions related to Death are powerful and poignant. The claustrophobic feeling created by all the unnecessary do-gooders who believe they know what is right. In addition to biological death, there is also another kind of loss. The need to abandon your homeland in search of a better life. The ordeal of the immigrants arriving in New York, the move to Vienna, to Prague, and Moscow, the Berliners who found themselves isolated and downgraded in the blink of an eye. There is no home for the ones who are rejected by society and the domestic environment is no less harsh or oppressive. Religion plays a significant role in the story. Christian and Jewish citizens fall in love with each other, people are branded because of their religious beliefs, hunted and massacred. Throughout the story, the writer poignantly demonstrates how we all share the same feelings despite the fact that we may pray differently. People of different religions and nationalities are united by the same hardships and fears. No matter how we call God, we all want one thing. Peace. War is the bane of our existence. Erpenbeck uses ominous symbols like lightning, storms, and earthquakes to refer to eras shaken by the vicious human nature. It doesn’t matter where we are. Vienna, Prague, Moscow or Berlin. Whether we are in 1920 or in 1938 when Hitler’s darkness spread over Europe, leading to the Second World War when Stalin’s dominance in the Soviet Union became absolute. Sometimes, peace seems only an illusion in the darkest moments of History and the period following a war is even more difficult because societies are in ruins and populations are devastated. Erpenbeck enriches the novel with various cultural and historical references. She vividly paints the various eras and places of action. The descriptions of the Viennese streets are so beautiful…Die Fledermaus by Johann Strauss, a favourite operetta, Oscar Wilde’s Salome, one of my favourite plays, Ibsen’s The Wild Duck, the legend of Melmoth. Rosa Luxemburg, the KGB, the daily life in the GDR, the massacre in Lviv pass before our eyes. In various writing styles (stream of consciousness, monologue, unpunctuated dialogue, non-linear narrative), Erpenbeck writes about motherhood, death, despair, and hope, ending in the time of the Reunification of Germany. Time means everything and nothing. Nothing changes and yet fundamental alterations take place in the blink of an eye. What would have happened if…?The eternal unanswered question that defines History and the fate of us all. You do not want to miss this masterpiece…. Such a thoughtful review. This is the first Erpenbeck I read and it remains my favourite. Thank you so much! It is my first Erpenbeck foray and it won’t be my last. I was captivated by her writing and ”Gone, Went, Gone” will follow soon. 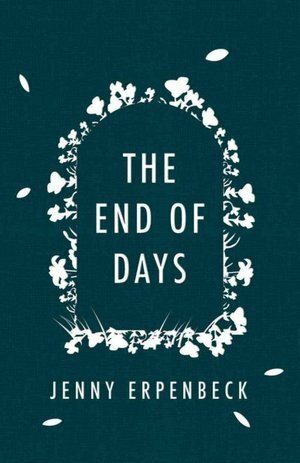 Also very good although very different from The End of Days. I’d also recommend Visitation, my second favourite of hers. This does sound totally wonderful. I am definitely intrigued, Amalia. It is highly recommended,, Marialyce!